Forget streaming applications, share buttons and chip architecture -- the success of the next-gen video game consoles will be dictated largely by software. Games sell the system, and we couldn't help dropping by Sony's E3 booth to see what the PlayStation 4 is promising its early adopters. Join us after the break for a quick look at what the console will offer during its launch window. Wondering how next-gen PlayStation games were going to make use of the DualShock 4's tiny touchpad? 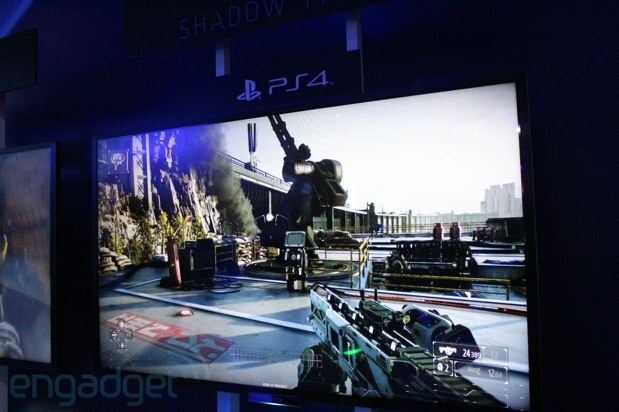 Killzone: Shadow Fall is one answer. The series' latest iteration uses the touch surface as a quick-key shortcut for accessing special abilities. Swiping to the right, for instance, enables a futuristic zipline tool for stealthily dropping into new locations -- mirroring the gesture equips an energy shield and swiping up produced a drone. It's a simple introduction to touch gaming on a traditional controller, but it's intuitive, simple and effective. Sony told us that these touch-access tools enables players to be a bit more tactical and stealthy than they could in the series' previous games, but we still saw plenty of action in our short demo. The PS4 exclusive title wasn't hard to look at either, and flirted with the kind of visuals usually reserved for PC gaming. It's a classic story: Octopus-man meets girl and spends the rest of his life trying to hide his ocean origins from his family. 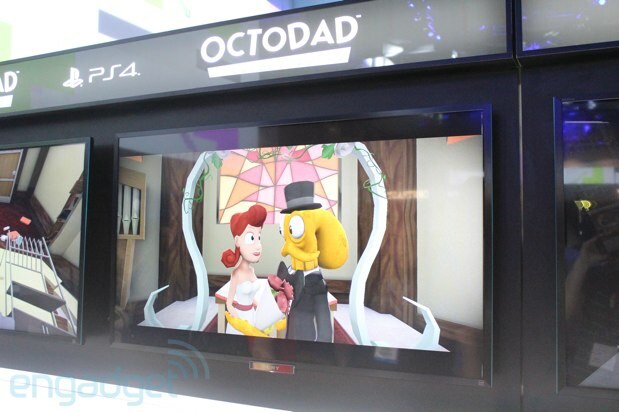 Octodad: Dadliest Catch is a bizarre, hilarious limb control simulator. Players control a single limb at a time, awkwardly tumbling their celephalopod avatar through an otherwise normal life with the simple goal of being inconspicuous. It's a challenge to Octodad's boneless limbs to do simple tasks like doing dishes or opening doors, but it's so amusing, the difficulty curve is completely forgivable. This quirky indie title had us smiling from ear to ear. 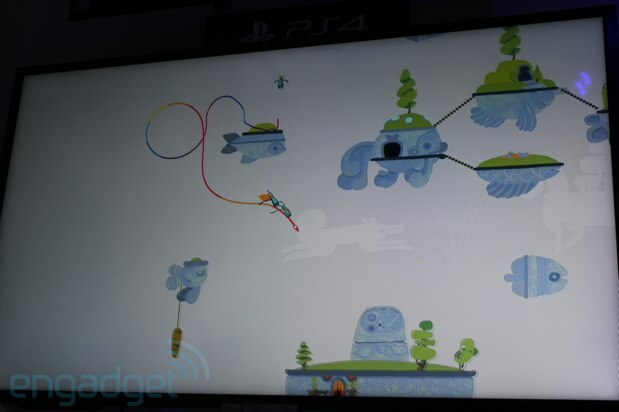 When we approached the Hohokum kiosk, its handlers directly refused to tell us what it was about -- we were simply handed a controller, and were told to have at it. The reason for their silence was clear: Hohokum is a quirky, abstract and very free-flowing title. It's definitely difficult to describe. Players pilot a tadpole-like creature through a variety of worlds, exploring landscapes, interacting with characters, and generally taking in the title's abstract style. The elongated line the player controls moves of its own accord, but players can dictate its course, and can even adjust its speed by how they pilot it -- wiggling back and forth for instance (like a tadpole, see?) speeds the creature up significantly. It's definitely a strange game, but playing it is pretty relaxing. Let's call it "reminiscent of flOw." Racing fan with a PS4 pre-order? 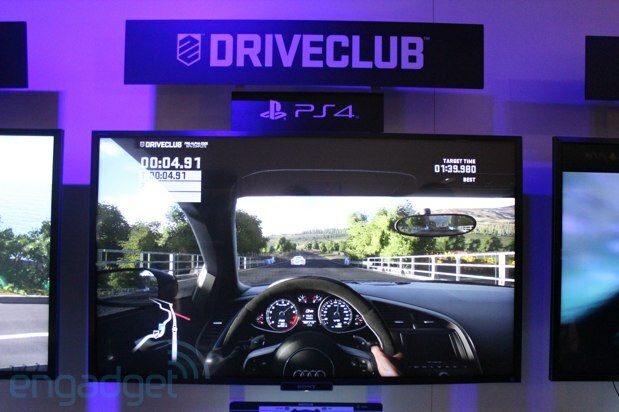 You're looking at Driveclub -- Gran Turismo 6 is hanging back with the previous generation. On the other hand, the GT series doesn't use the new PlayStation Eye. As the game loaded up, it snapped a quick picture of us -- but as before, the image came out pretty blue. It was probably had more to do with the dark lights in the Sony booth than the PlayStation Eye, but it definitely wasn't a great likeness. After a few rounds around the track, we adjusted to the game's semi-realistic handling. A nearby dev commented that the game is designed to be accessible, but still fairly realistic -- this isn't a serious driving simulator, but it flirts with enough realism to get the feel. Driveclub may not be a completely satisfying replacement for fans looking for a next-gen Gran Turismo game, but it'll do in a pinch. Looking for a simple, fun and completely accessible PS4 game? 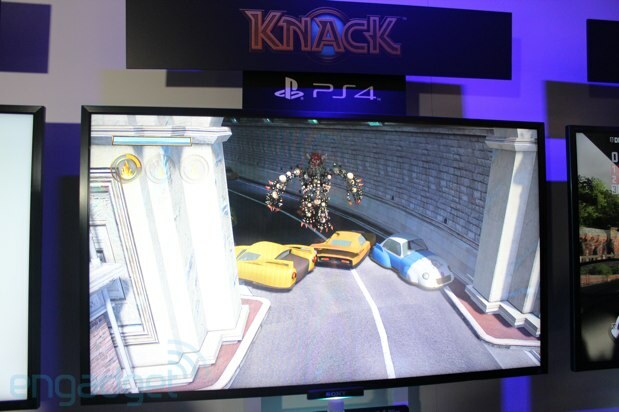 Knack is your game. This action-platformer doesn't steer too far from the genre's norms, but it executes the formula well: offering smooth animation, good visuals and satisfying action. It plays a little bit like a mash up of Ratchet and Clank and a Lego game -- taking the combat of the former while adopting the obsessive stud-collection of the latter. Certain items in the game produce rocks and rubble, which your character absorbs to grow and become stronger. Our only real disappointment with Knack is that it isn't a launch title, launching on Vita, PS3 and PS4 simultaneously in 2014.